Like most people with tattoos, I’m very passionate about mine (otherwise, presumably, I wouldn’t have gotten them). If you’ve talked to me about mine, you know what I like about them, materially and ideologically, and what each one means. Most importantly, I’m intrigued not by the significance of this image or that, but by the irrevocability of the tattoo. That kind of commitment transcends other physical alterations – you are committing to adding something to your body, your self, for the rest of your material body’s existence. Of course, you can have a tattoo covered with a new image or removed, but the point of getting inked is that you intend for the tattoo to remain forever. Even if that intention wanes and you change your mind, at some point you believed you could live with it forever. 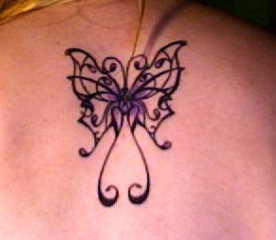 My first tattoo was a purple and black filigree butterfly between my shoulder blades that I got in July 2007. This event coincided with a time in my life when I had been feeling quite powerless and frustrated – a shell-of-my-former-self sort of self-loathing. The metamorphosing butterfly is a symbol I’ve always identified with. I love butterflies – I love the symbolism, I love the colours, I love the symmetry. I looked at a print-out of this image for almost a year before the time was right and I decided to make this butterfly a part of my body. Getting my first tattoo was a sublime experience for me – in such a simple way, I could alter the surface of my body and incorporate artistic and meaningful images into my presentation of self. It’s simple and personal, but it’s empowering. When people ask if it’s painful I often say no – no, as in that it’s not a pain that you can’t endure. If course it hurts, some places more than others, but it’s a very sublime and thrilling sensation of pain. My emotional experience of each of my tattoos was elation, during and after. The ongoing, persistent nature of the pain triggers a release of adrenaline – it is a rush. As many people with tattoos can attest, once you have one it’s easy to keep going. My desire has never been to have many visible tattoos and be a heavily tattooed person. I enjoy the choice to show or conceal. That being said, my four tattoos are all in easily showable areas, and showing my foot tattoo in a sandal or my back tattoos in a dress feels akin to wearing jewelry or putting on make-up – it’s all part of my physical presentation. A year later, in May 2008, I decided to tattoo my foot with the quote “Reason Over Passion” and, on a whim, a tiny frog silhouette because, well, I’ve always loved and owned frogs (and continue to have one sole survivor, Brutus the African Dwarf frog, at home in NL). A good artist listens to what you want but has an investment in the image and the placement. My artist suggested the placement on the top of my foot instead of ankle, which I love and am so happy with, and incorporating the words and frog into one pattern. Many people have commented on how I seem more of a “passion over reason” kind of person. This tattoo signifies my efforts to maintain a balance, and keep reason in the equation. 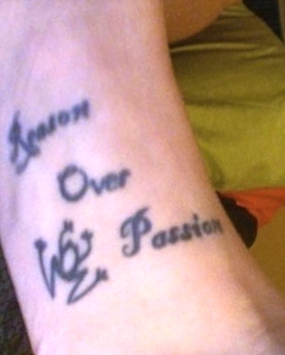 Truthfully, I identify with both reason and passion in different ways, and enjoyed the irony that this tattoo provoked. I studied this poem in one of my first English courses at Memorial University and, even having no tattoos at the time, I was immensely moved by the language and the sentiments expressed. 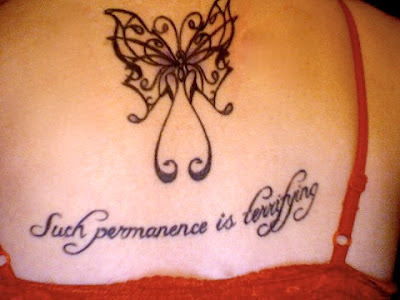 A poem about tattoos, and about experiencing the tattoo’s on a lover’s body with a sublime fascination and terror, the line “such permanence is terrifying” summed up my understanding of tattoos and their significance to me, on my fleshly, mortal body, that I decided to tattoo this line on my back. I love word tattoos, not surprisingly, and this line seemed exceptionally fitting for a text tattoo. 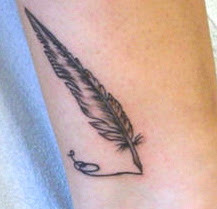 My last tattoo, for the time being, is a quill on my lower leg above my ankle that I got in July 2010, for my love of writing and studies in English. Kim Addonizio, “First Poem For You” from The Philosopher’s Club. Copyright © 1994 by Kim Addonizio.